A couple of weeks ago during team lunch, the special salad was basically the combination of all my favorite things: bacon, bell peppers, goat cheese, and balsamic vinaigrette. Served atop a bed of mixed spinach and arugula, it was one of the best salads I’ve ever had, in addition to being the perfect size for lunch. I expressed my ecstatic review, as well as requested they put it on the regular menu, which is something I’ve never actually bothered to do at a restaurant before. Since they haven’t heeded my advice yet, I set out to recreate a similar experience in my own kitchen. It might sound plain and possibly too light, but with a slice of bread and a latte (I always get a latte at Fresco) it was properly filling without leaving me feeling overstuffed and heavy for the rest of the afternoon. Roasted red peppers are something I could eat with every meal, and you’ve probably already noticed I have a slight obsession with goat cheese (blame Costco.) 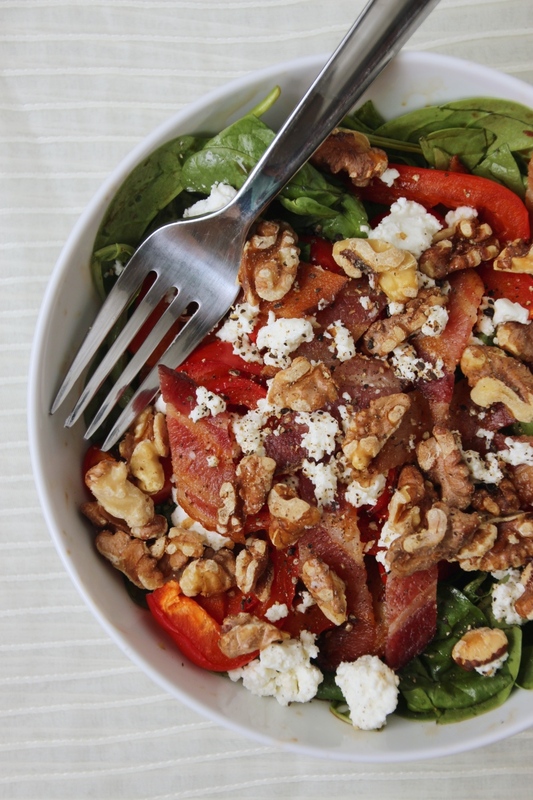 Bacon and walnuts bring a little salt and a lot of protein to the dish, and a bed of leafy greens rounds out the meal nicely. The original uses their house-made balsamic vinaigrette, but I opted to dress mine with plain balsamic vinegar from my local oil and vinegar spot. This was mostly out of laziness but also because it’s one of my favorite ways to top any savory salad. In any case, you can substitute your favorite balsamic vinaigrette or reduction in its place for a more traditional pairing. I served mine with the bacon and peppers still warm (which will be extra great in the winter), but you could absolutely let them cool to room temperature during these excessive heatwaves everyone is having. I made myself all four servings and then each day assembled the leftovers for lunches this week. If you do the same, you could either serve it all cold or briefly reheat the bacon and peppers in the microwave before stirring it all together, as I’ve done for the past three days. Goes perfectly with a side of focaccia fresh from the Co-op. Preheat oven to 425 degrees Fahrenheit. Line a rimmed cookie sheet (or two quarter sheets, if you have them) with foil. If you’re using one sheet, create an edge of foil in the middle of the pan. Arrange bacon in one half of the pan; lightly coat the other half with olive oil and arrange the peppers on top. Bake for 20-25 minutes, or to desired doneness. Remove bacon to paper towels to drain and set aside bell peppers. Spread walnuts on the bare pan and return to the oven to toast for 3-5 minutes. Divide greens into four bowls or plates – don’t scrape the mixing bowl. Gently toss bell peppers in the large bowl with leftover vinegar/dressing, then arrange on top of the greens. Slice bacon on an angle into bite-size pieces and arrange in the bowls. Top each with walnuts, goat cheese, and freshly ground pepper. Enjoy immediately, optionally garnished with a slice of bread.